EUR is trying to really after US/China trade war cease-fire. 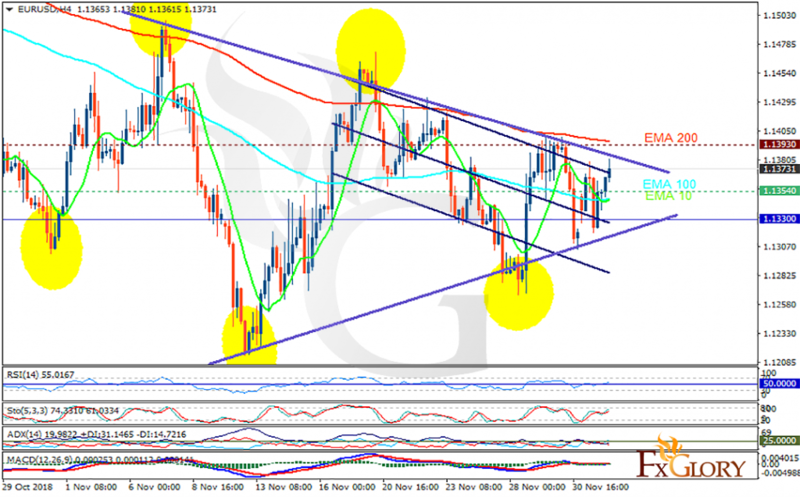 The support rests at 1.13540 with resistance at 1.13930 which both lines are above the weekly pivot point at 1.13300. The EMA of 10 is moving with bullish in the descendant channel and it has reached the EMA of 100 and they are both below the EMA of 200. The RSI is moving above the 50 level, the Stochastic is moving in high ranges and the MACD line is above the signal line in the positive territory. The ADX is showing buy signal. The chart has created a Symmetrical triangle so it would be difficult to know if it is going to grow or fall. Most probably EURUSD grows towards 1.145.